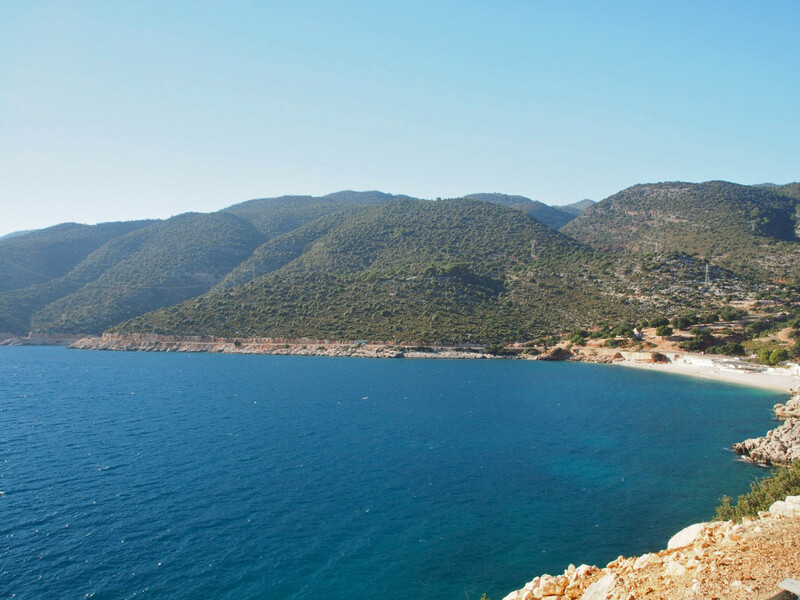 The Turquoise Coast stretches along the southwestern extremity of Turkey, and contains everything you’d want in a holiday-destination stretch of coastline: gorgeous beaches, clear bright blue water, ancient ruins, bustling tourist towns and sleepy forgotten villages. 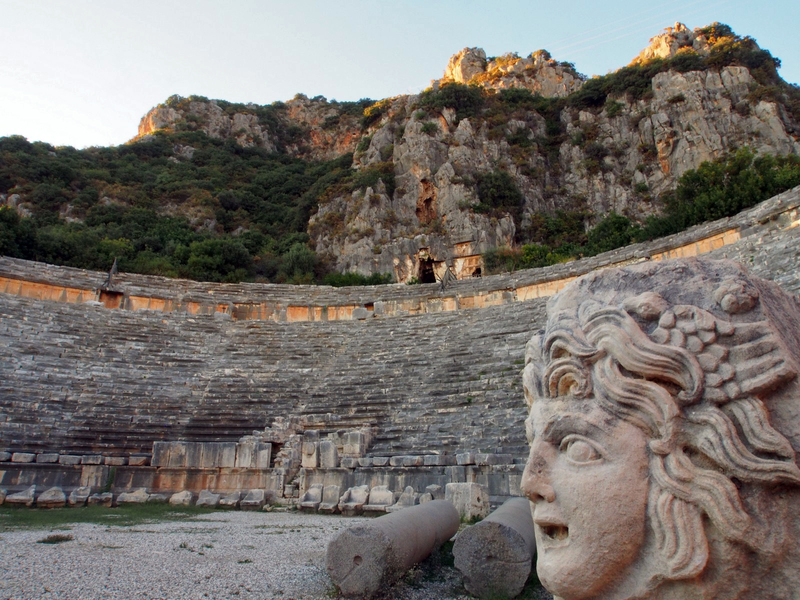 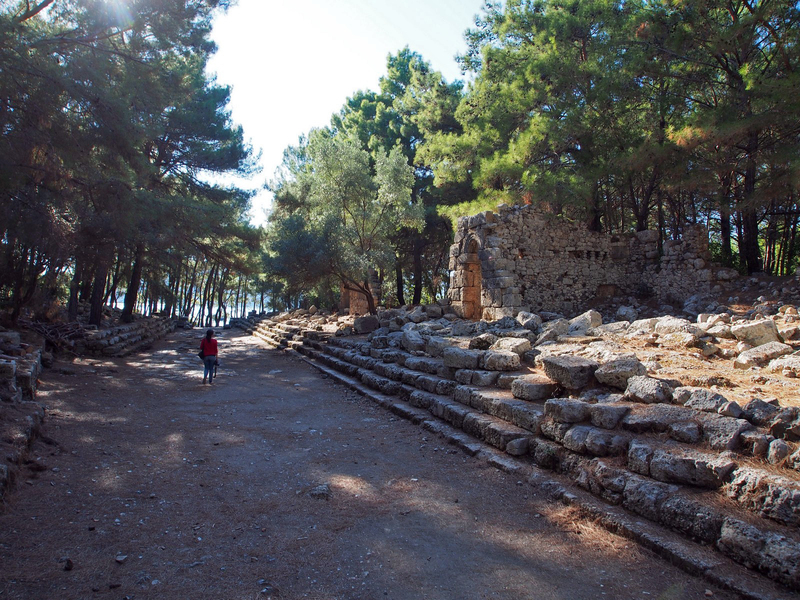 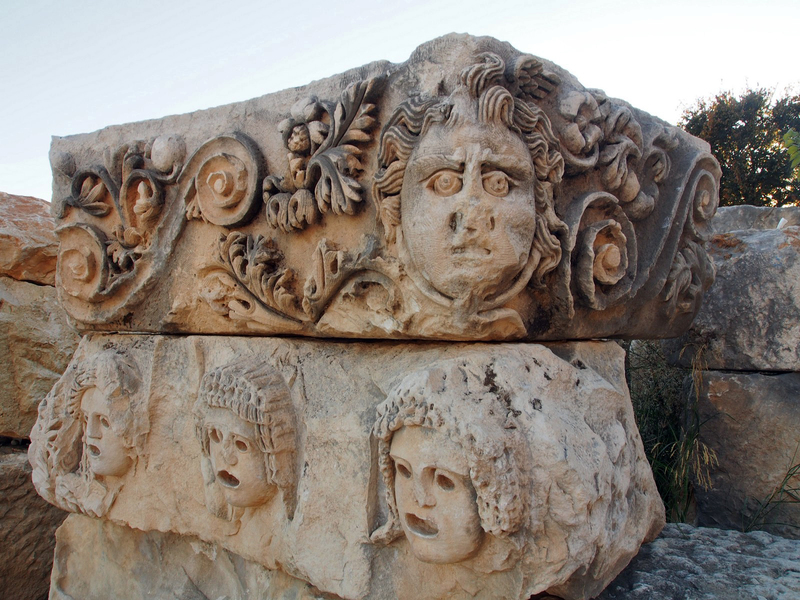 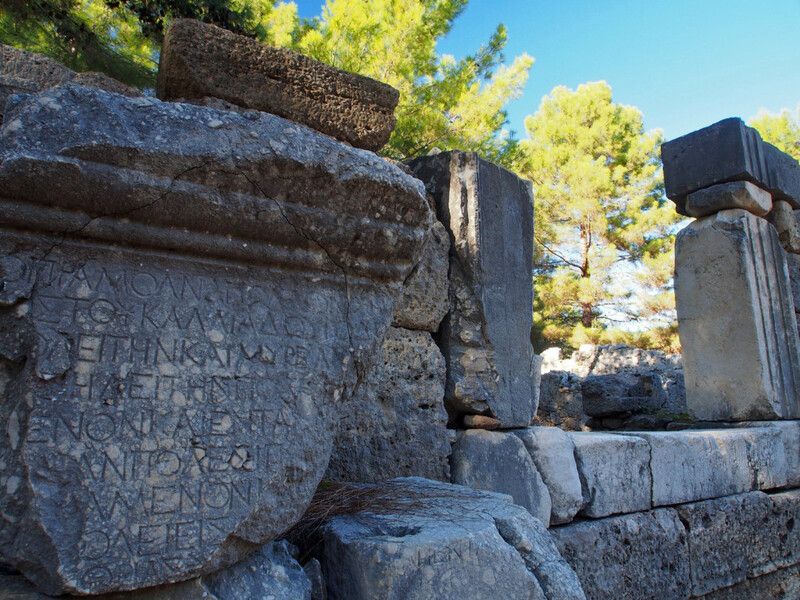 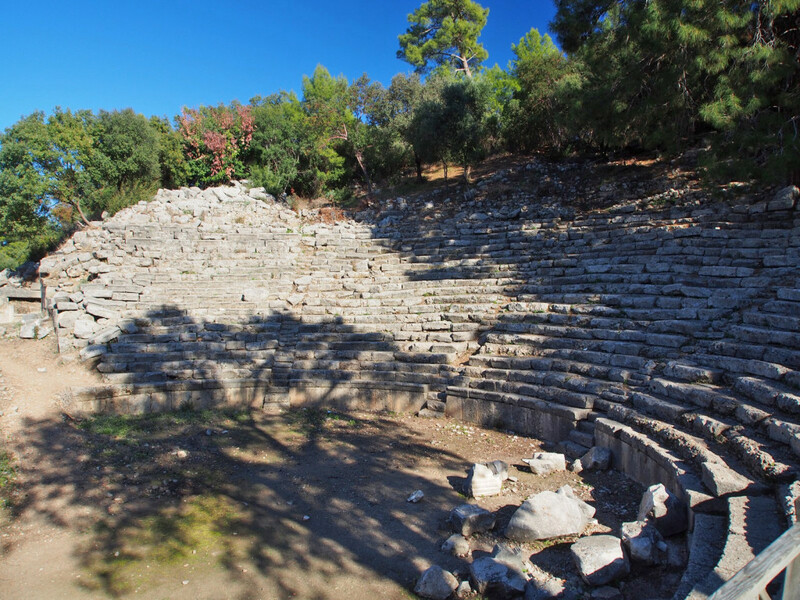 Just down the winding coast road from Antalya is the ancient settlement of Phaselis, founded around the 7th Century BC – although as with most of these sites, the ruins date from Roman times. 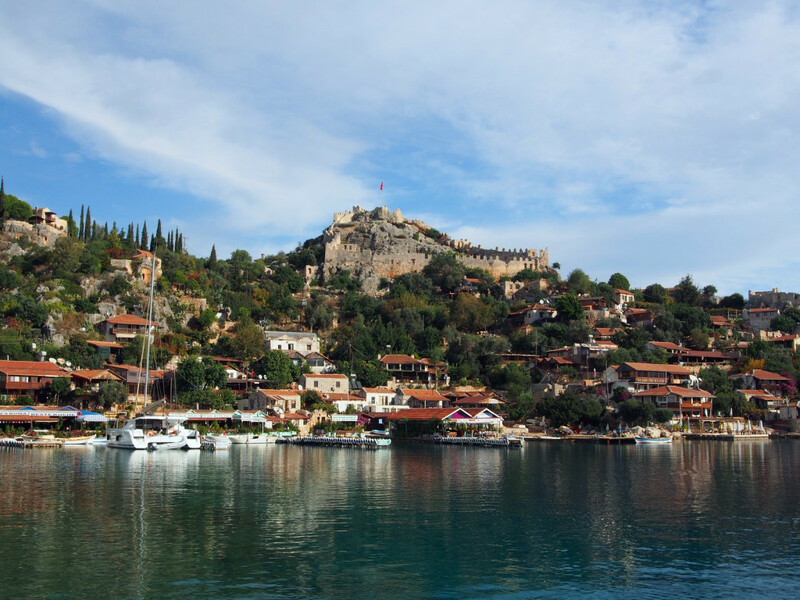 It was a port city, nestled on a small headland with rocky beaches on either side. 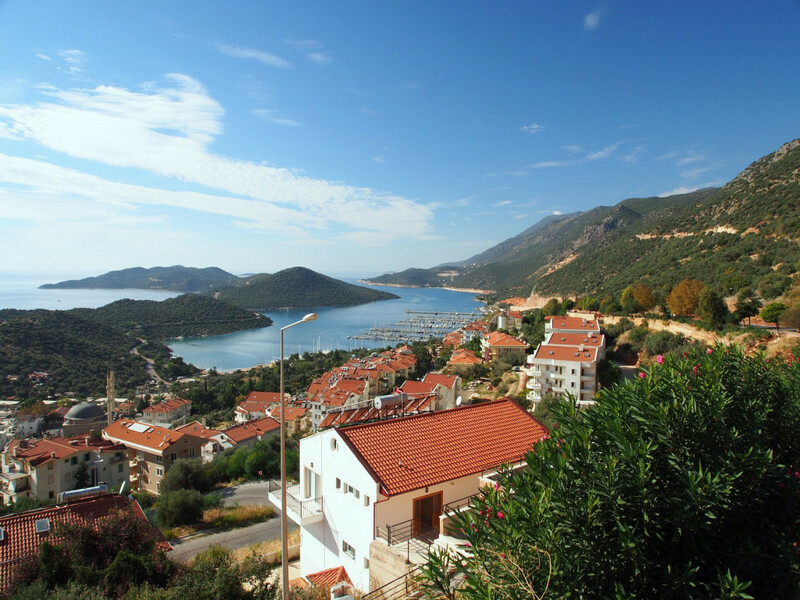 That afternoon we headed to the beachside resort town of Cirali – which was completely empty, since it’s the tail end of the season. 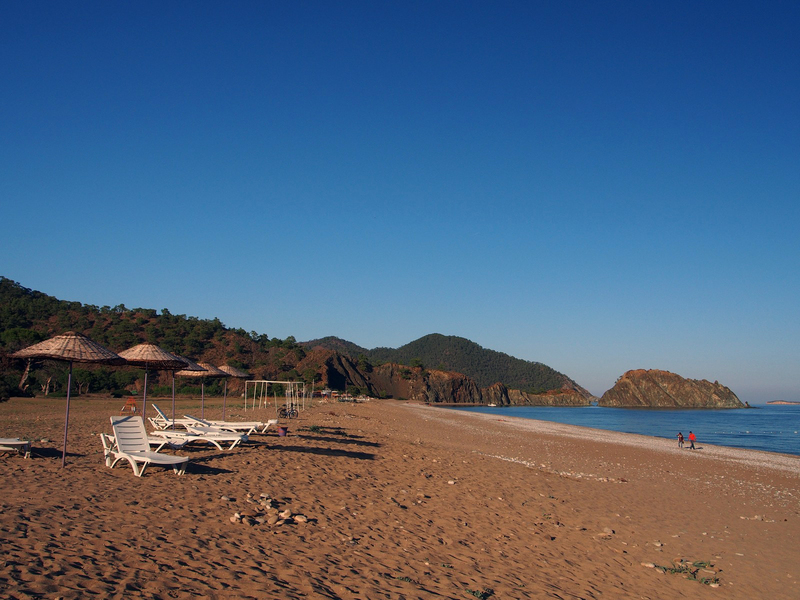 We found a place that let us set up our tent on the beach for a few lira, and shared a home-cooked meal with them after a bracing dip in the sea. 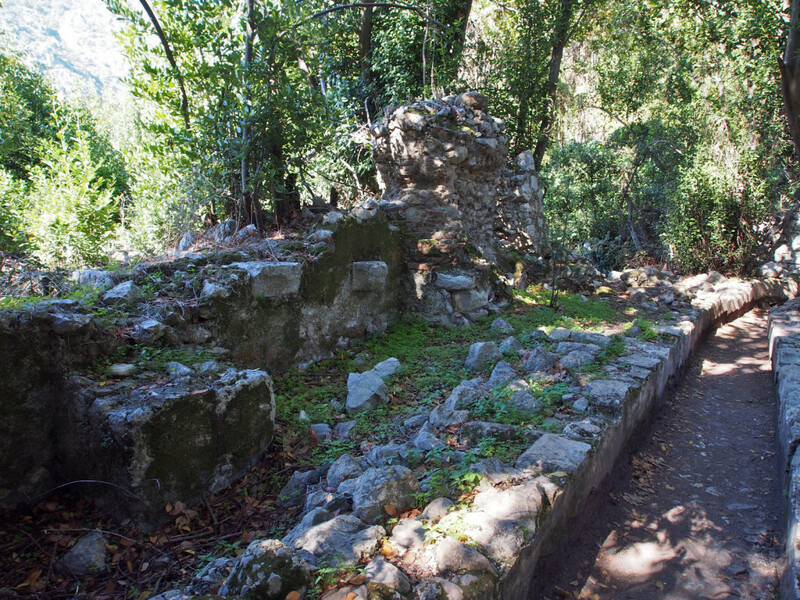 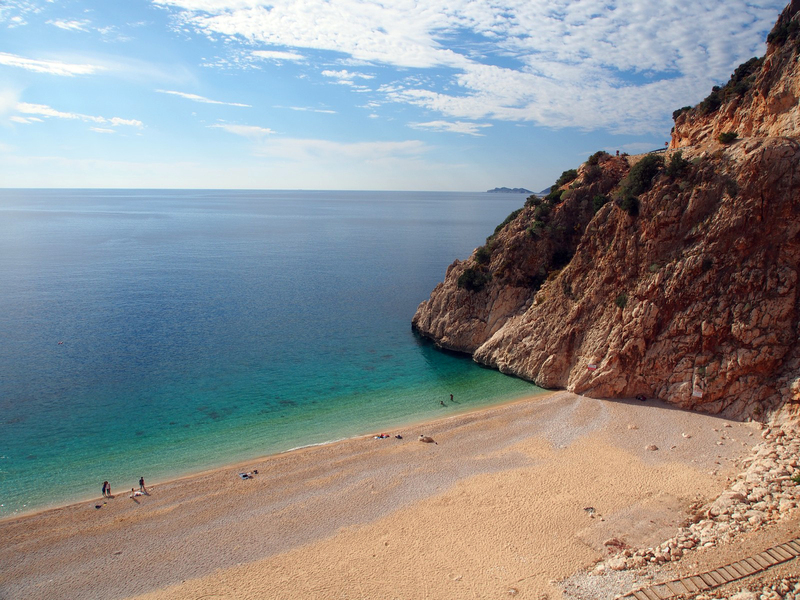 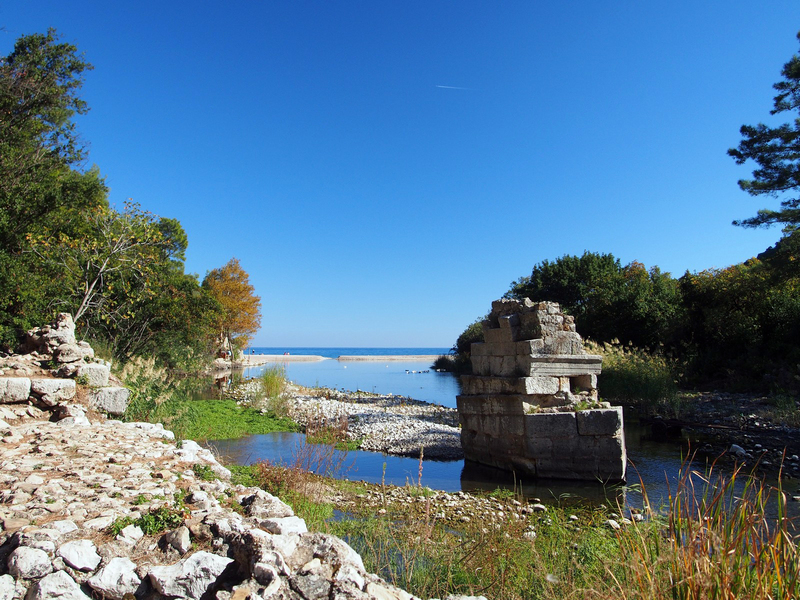 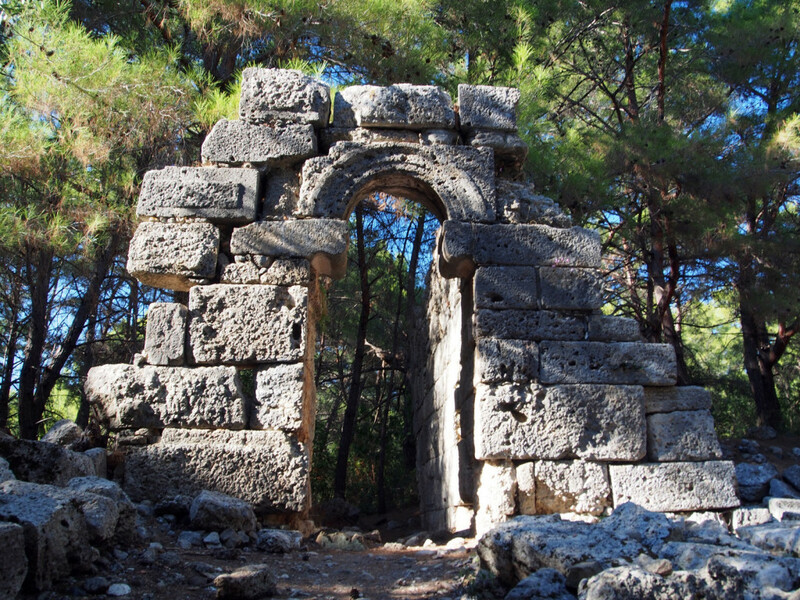 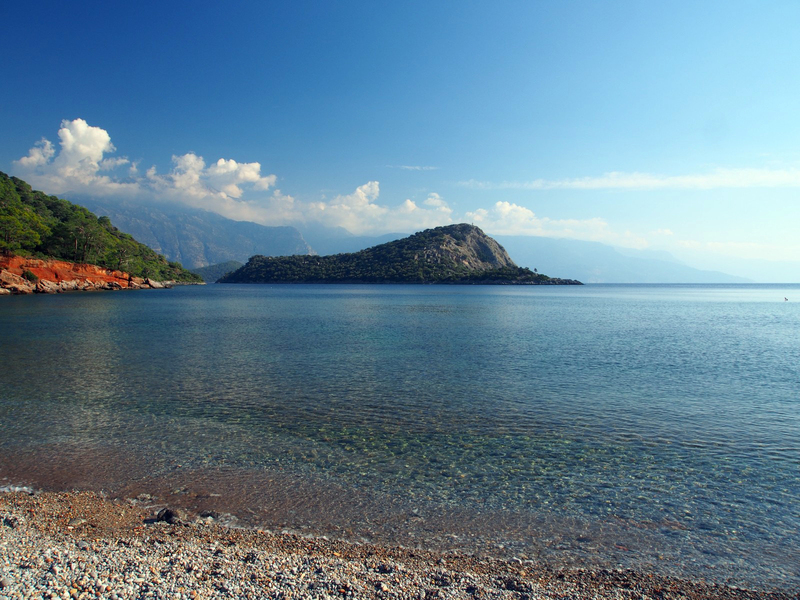 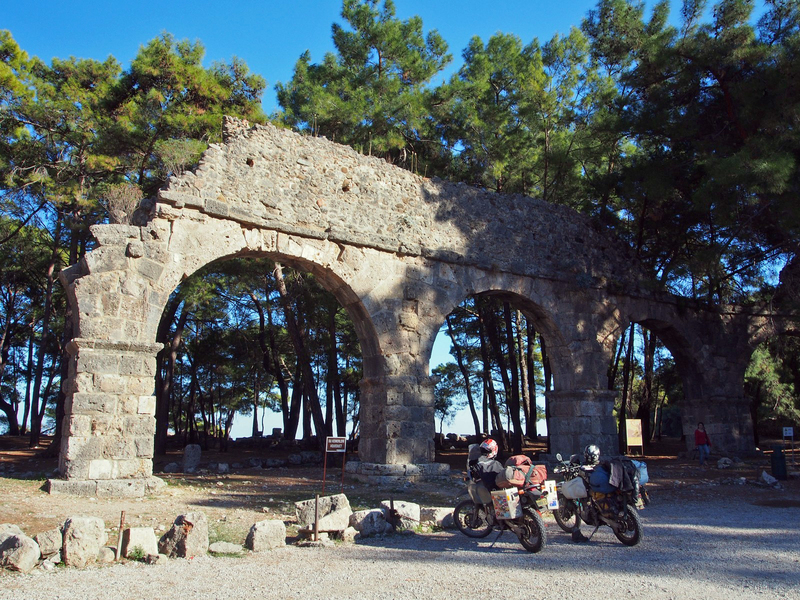 Just nearby are the ruins of Olympos, straddling a creek that runs across the beach. It felt a little like “Tomb Raider” here, as the ruins are half-hidden in the vegetation. 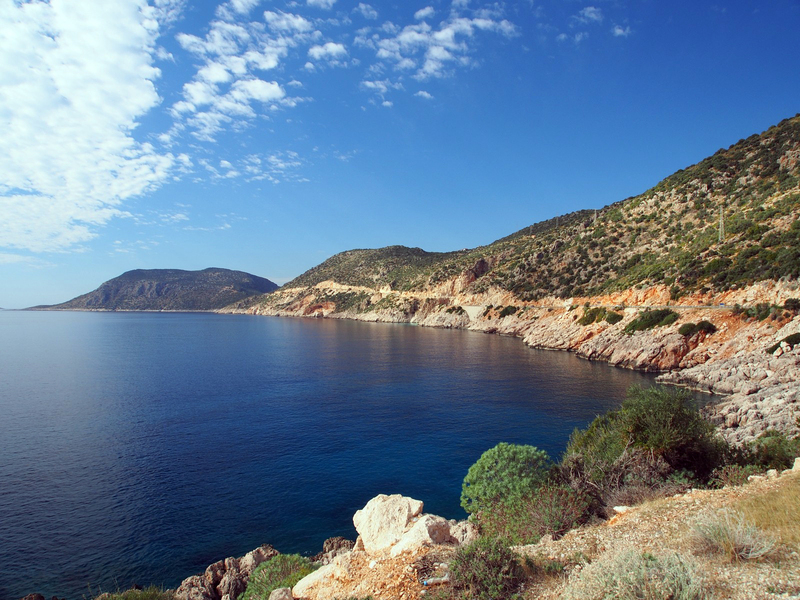 Most of the way for the next few days, the road wound sinuously along the coast, alternately hiding and revealing the deep blue sea. 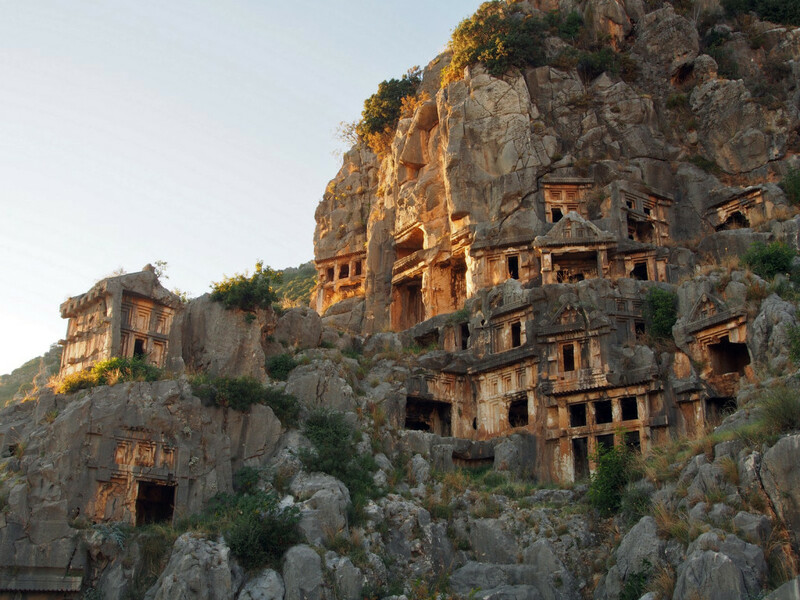 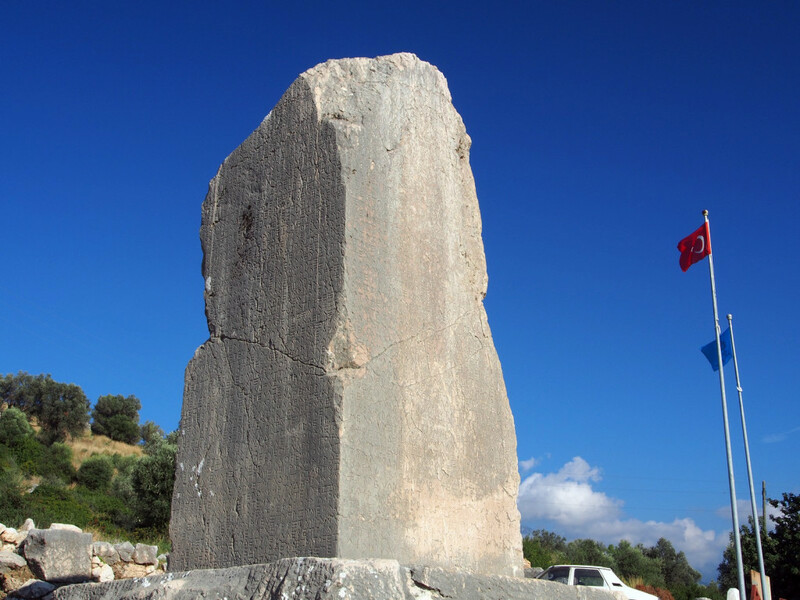 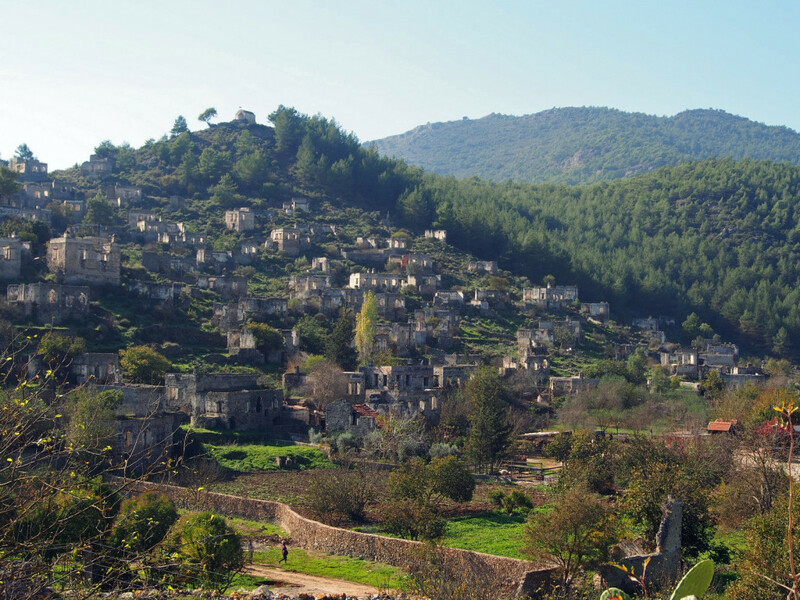 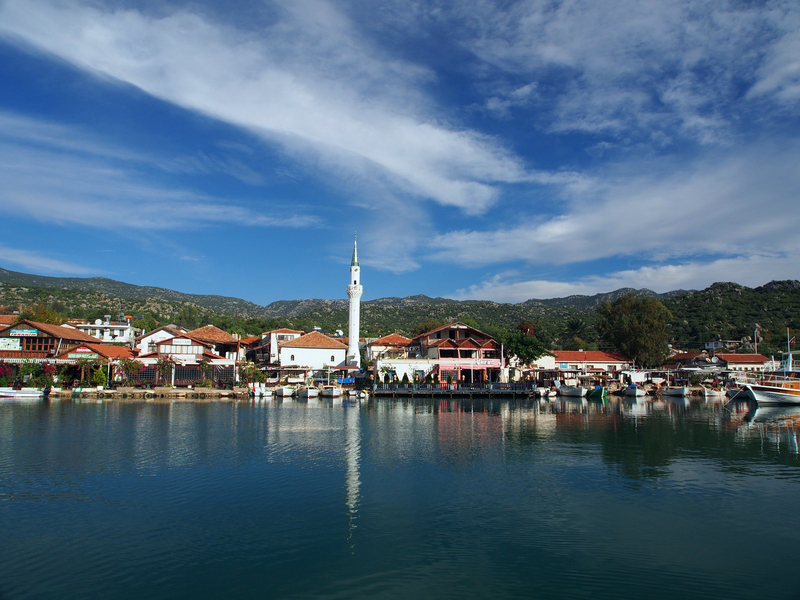 Further along the road is the town of Demre, known in ancient times as Myra. 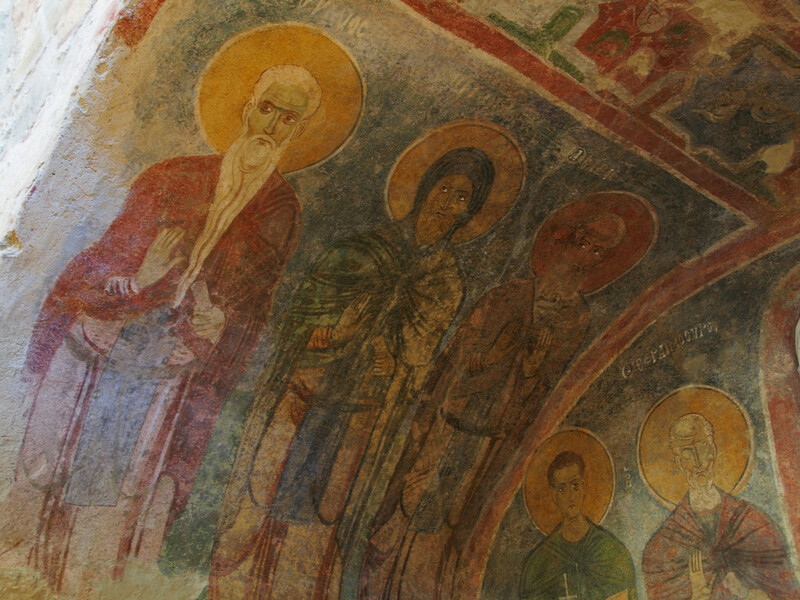 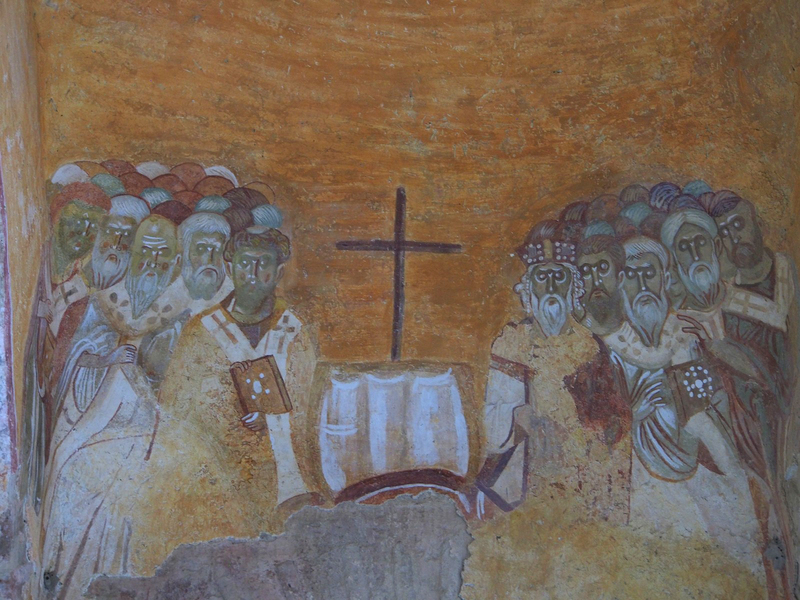 It was here that in the 4th Century AD that the local bishop insisted on wearing his bright red robes all year, despite the scorching summers. 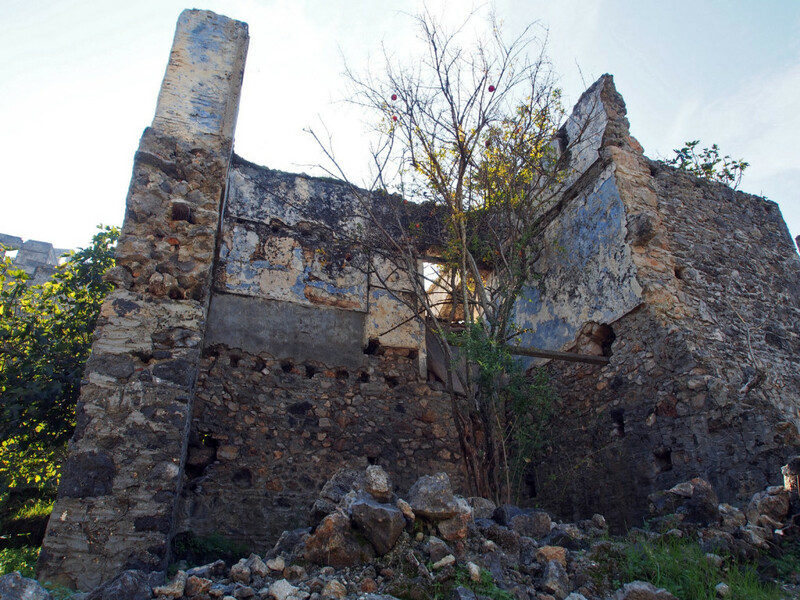 Legend has it that he used to save young girls from prostitution by dropping their dowries down the chimney, and also rescued some young boys from a serial killer. 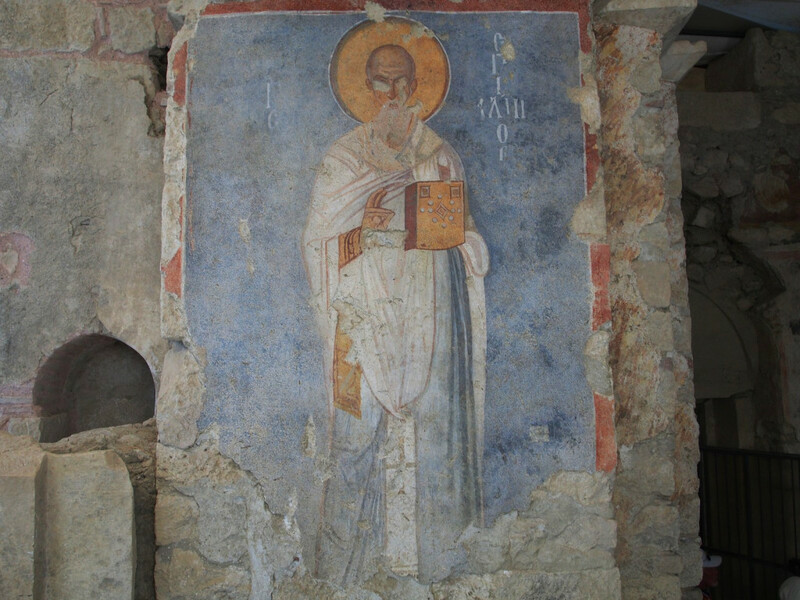 How the mythology of St Nicholas got mixed up with the North Pole and reindeers I don’t know, but the historical origin is in a local church here – a revered site for Orthodox Christians. 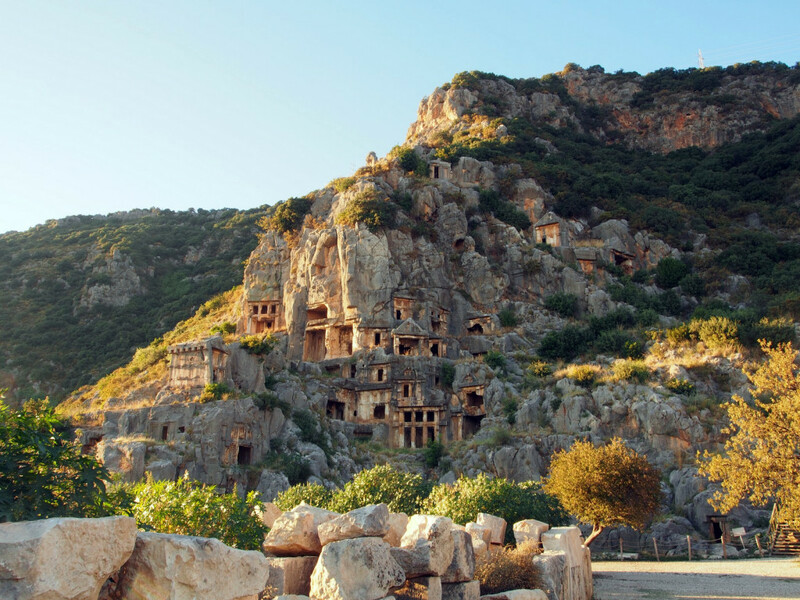 Nearby are the 4th Century BC ruins of ancient Myra itself, notable for the rock-cut tombs of the ancient Lyceans, and a Roman-era amphitheatre. 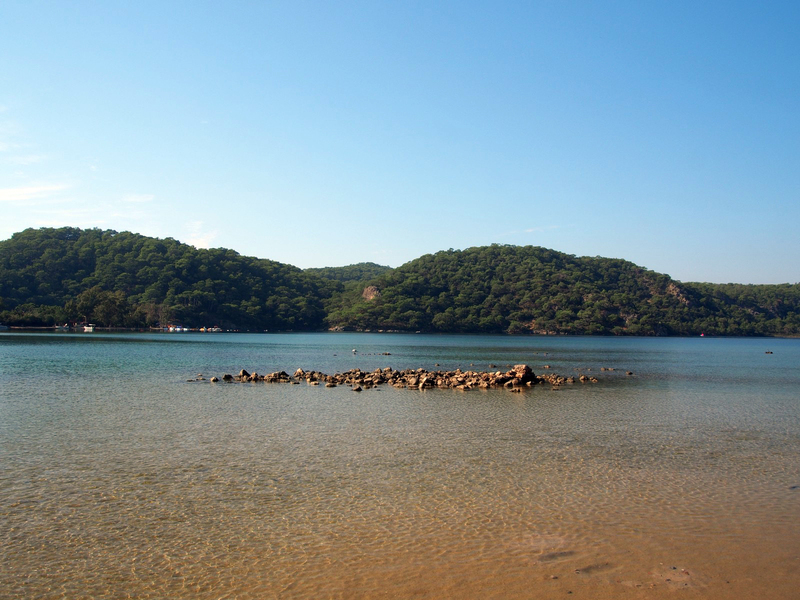 We got off the beaten track a little and headed down to the remote fishing village of Ucagiz. 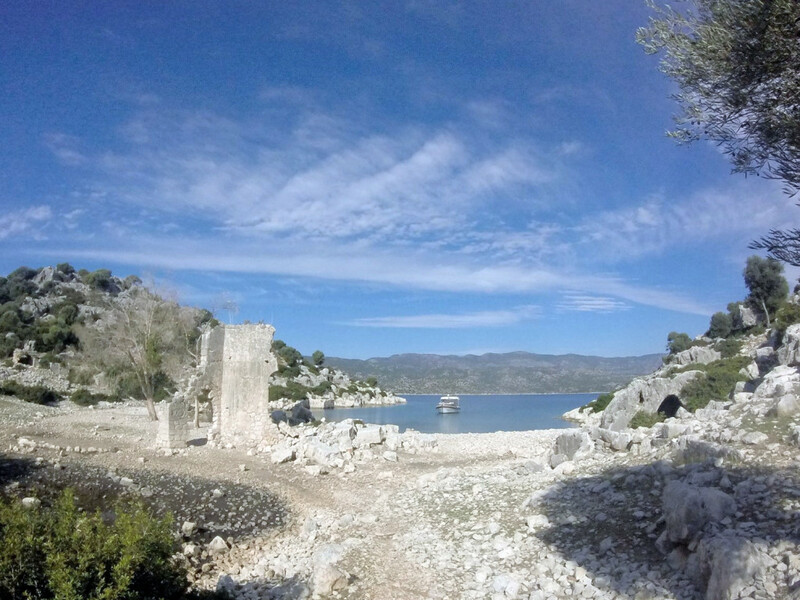 While it’s on the tourist trail, most people bus in and out for a short boat road. 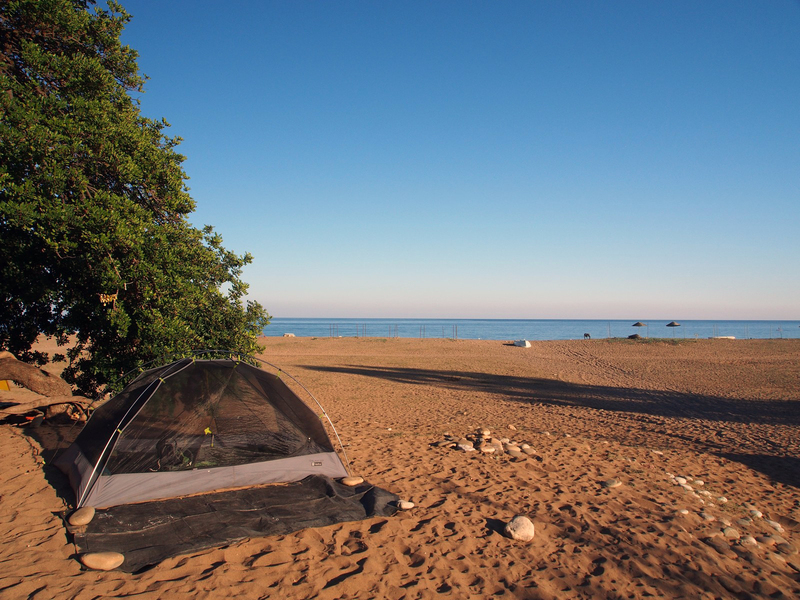 We camped just outside town and woke up to a gorgeous view over the bay. 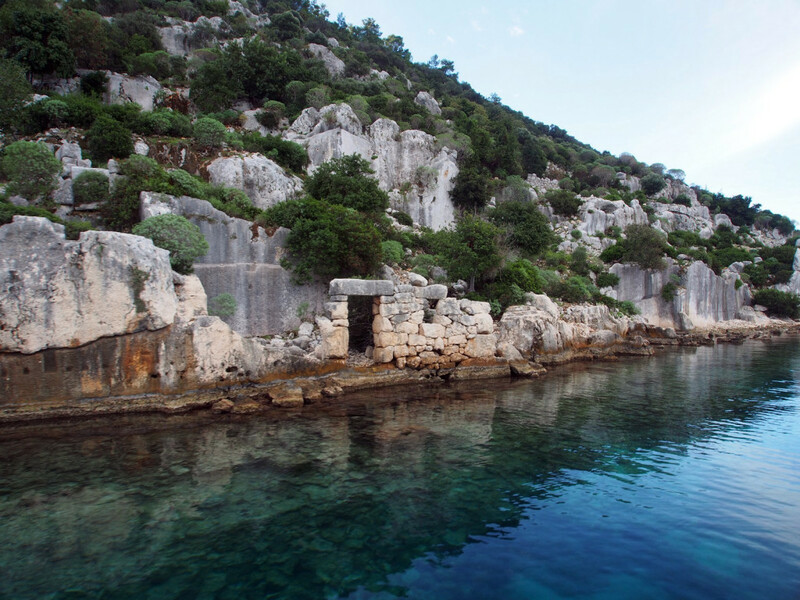 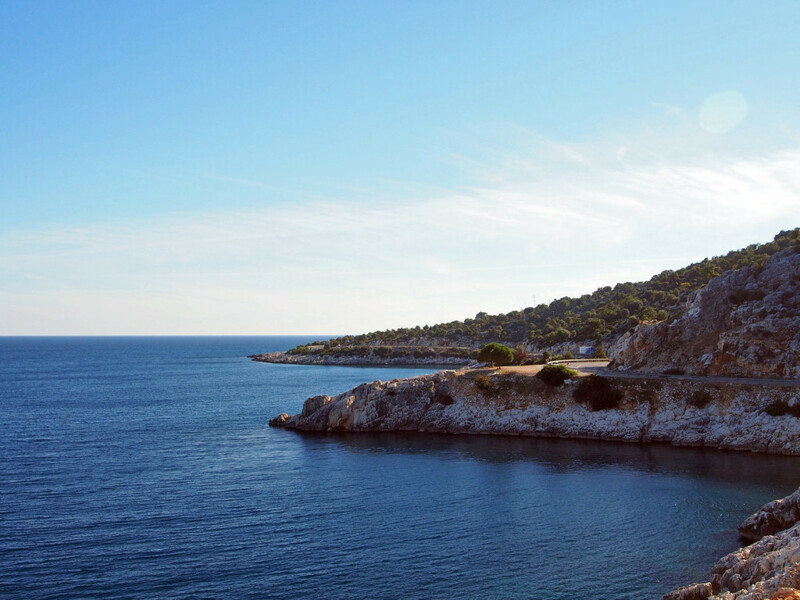 The reason the boat trips from here are popular is due to nearby Kekova Island, where some of the Roman-era ruins have become submerged due to rising sea levels. 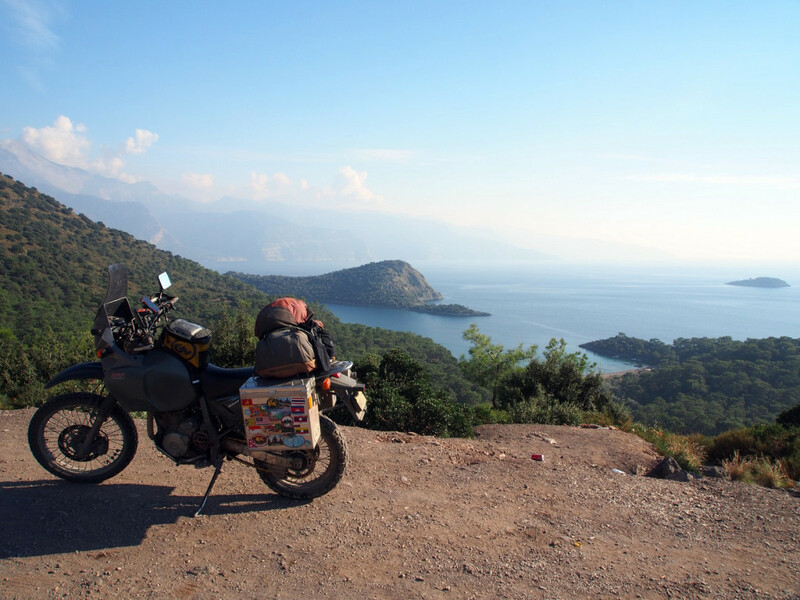 It was a gorgeous sunny day, as perfect for boating as for motorcycling. 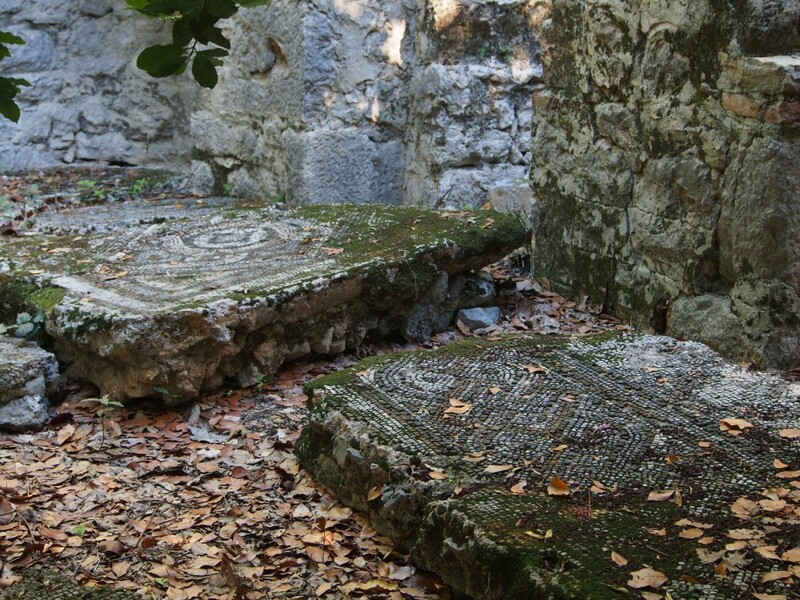 There’s a cluster of Lycean sarcophogi-style tombs just outside town, too. 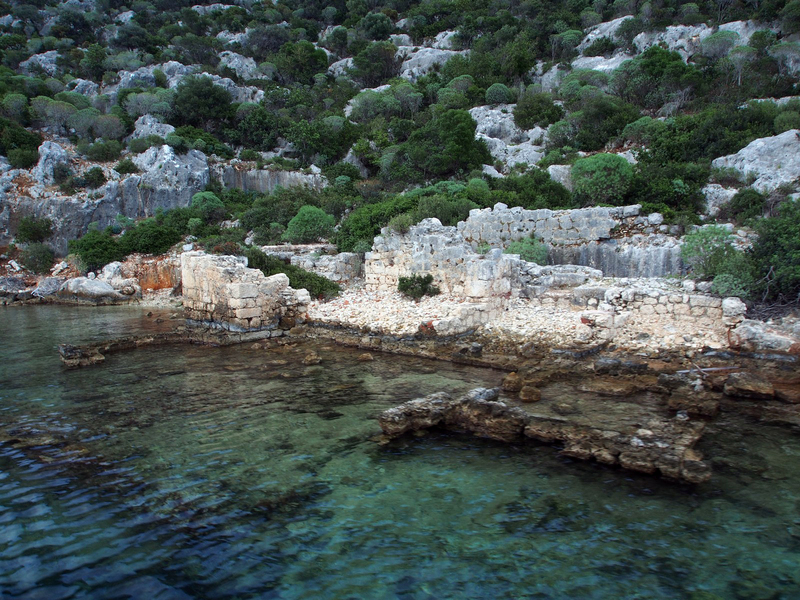 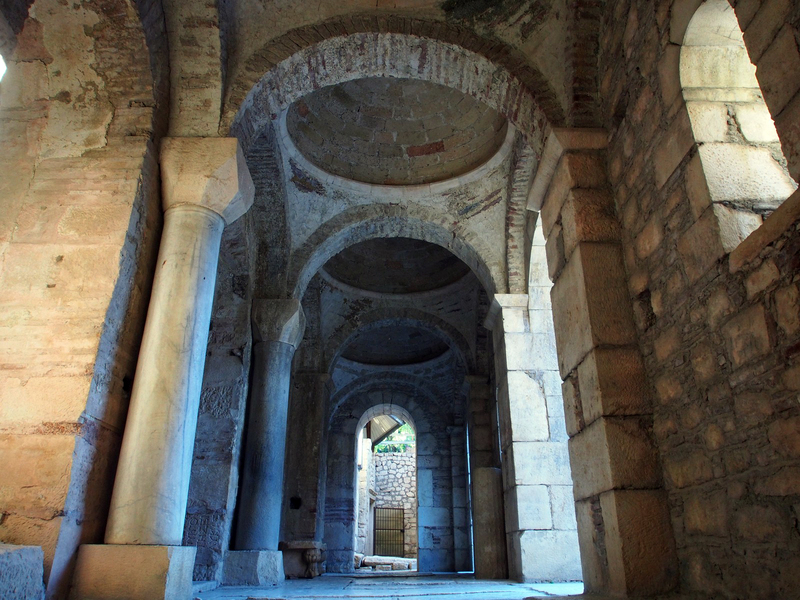 Also nearby is Simena Castle, built by the Byzantines to help combat rampant piracy in the Eastern Mediterranean. 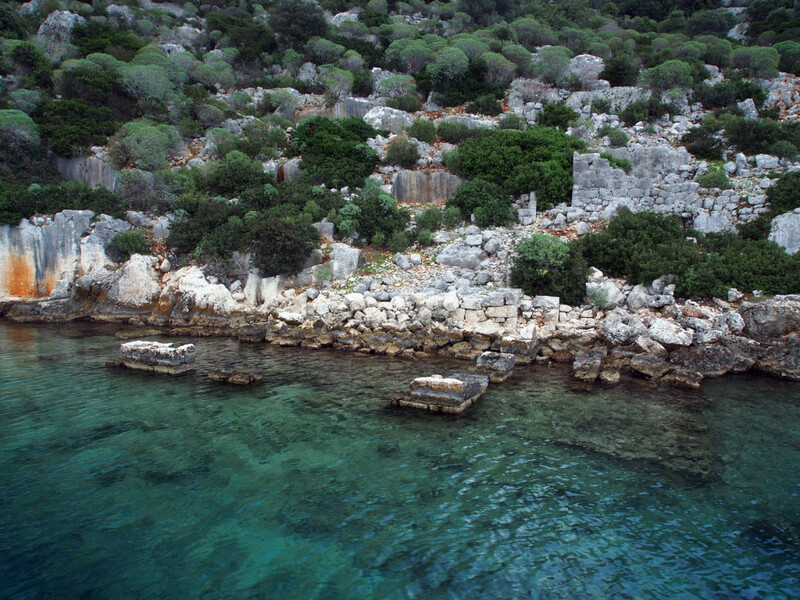 The ‘underwater’ ruins themselves are scattered along a hillside opposite, mostly actually above the waterline except for a few buildings. 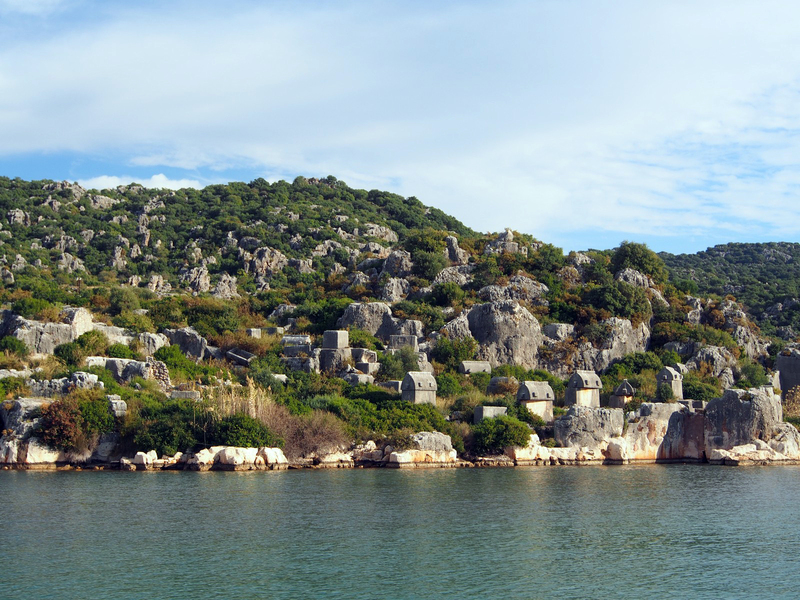 The only inhabitants of the island are a few hardy goats. At one point we swam ashore and explored a little. 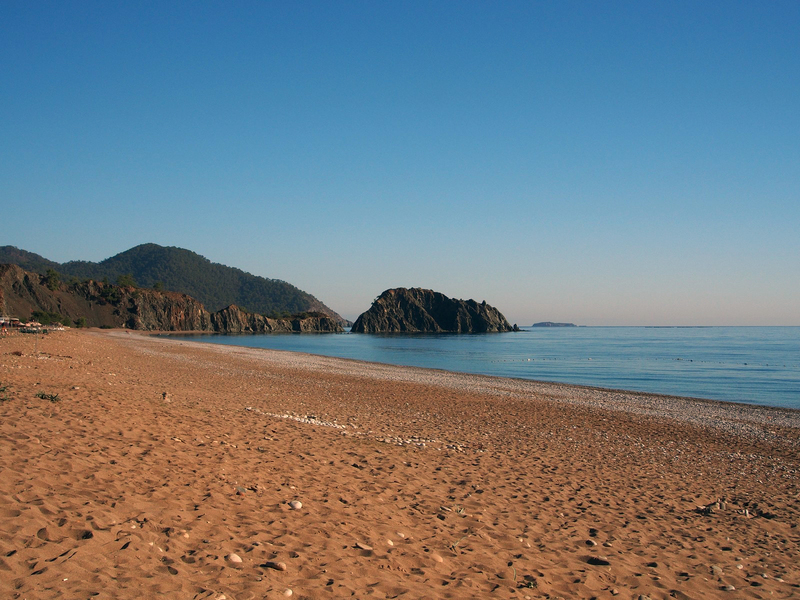 We pushed further west, passing through larger towns and empty beaches alike. 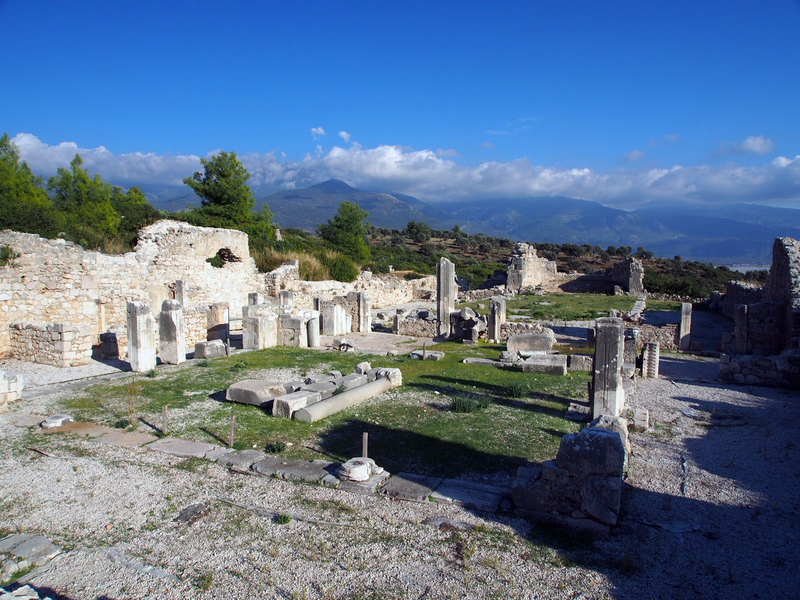 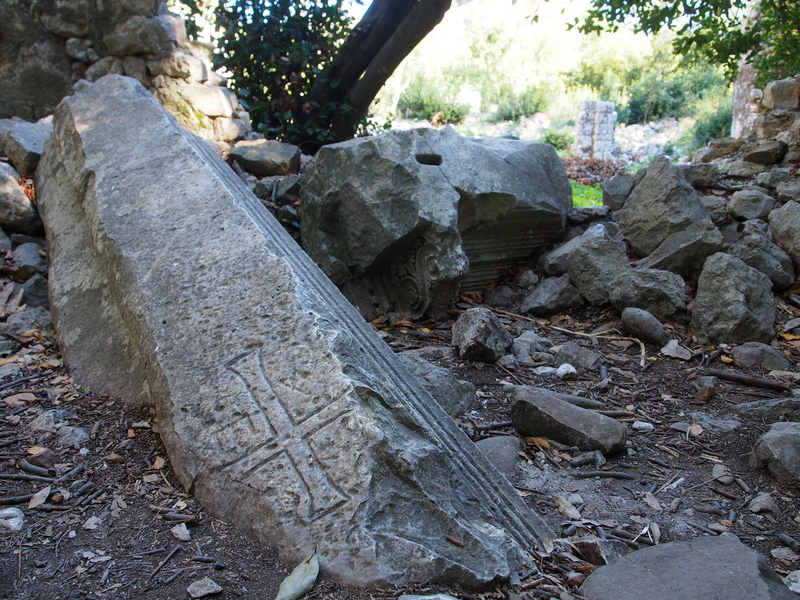 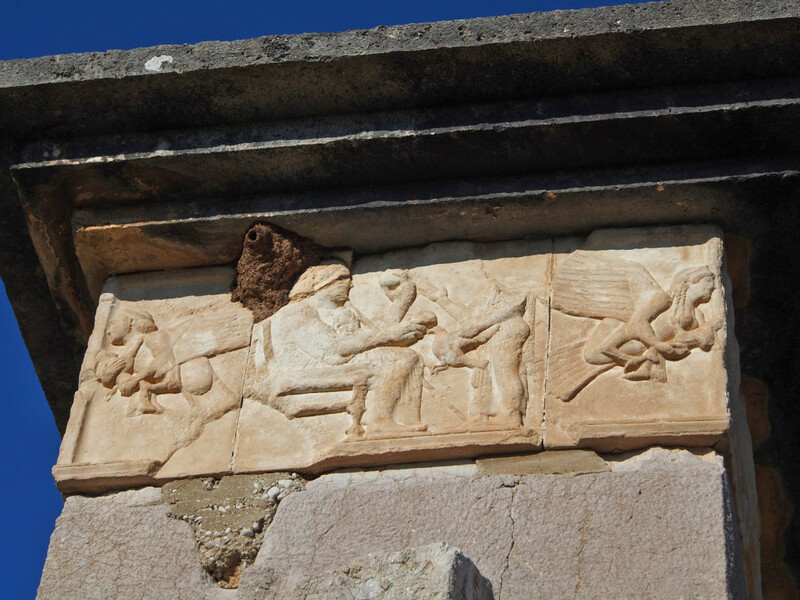 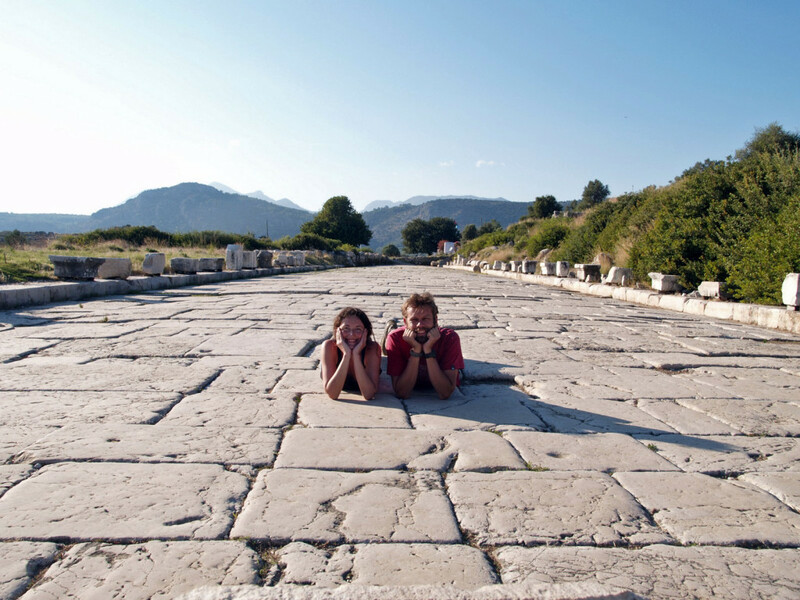 There’s another ancient archeological site at Xanthos, the former capital of Lycea. 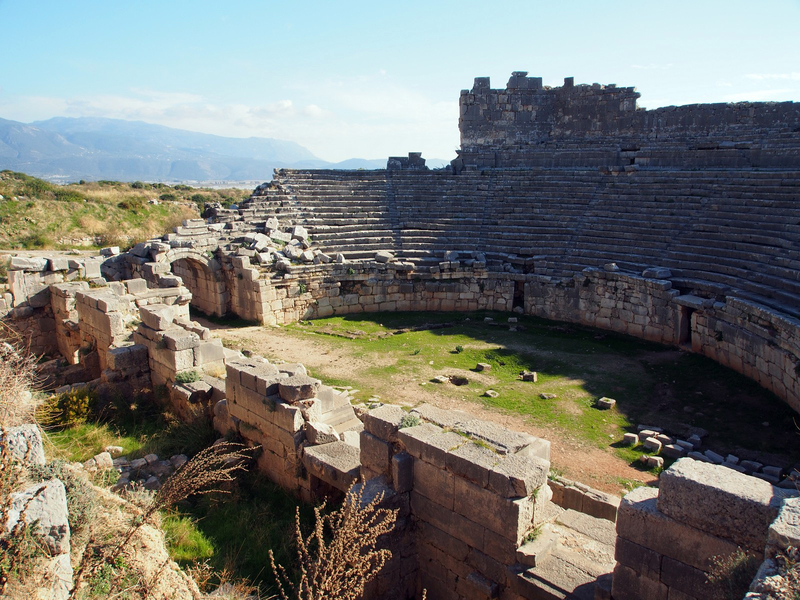 Its inhabitants committed mass suicide in the face of invasion not once, but twice – before the Persian takeover in 545BC, and again against the Romans in 42BC. 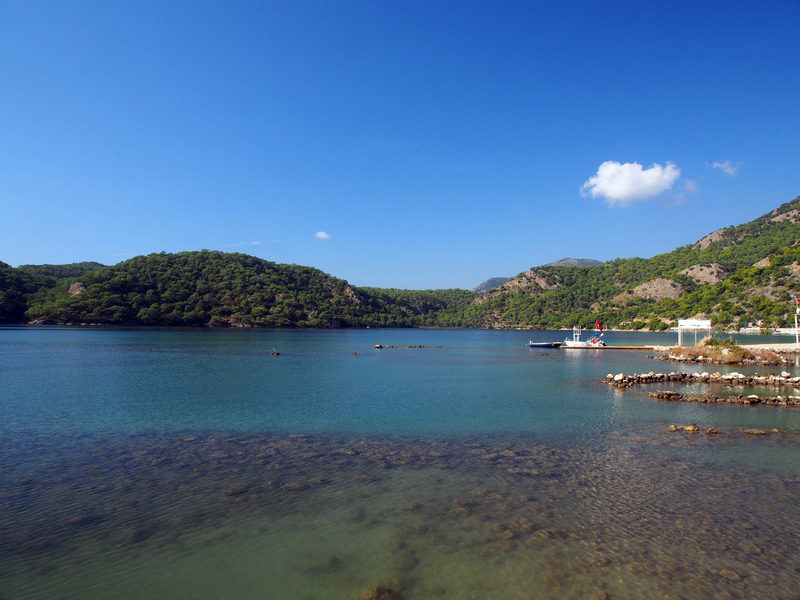 We pressed on and made our way to the famed “Blue Lagoon”, just south of Fethiye. 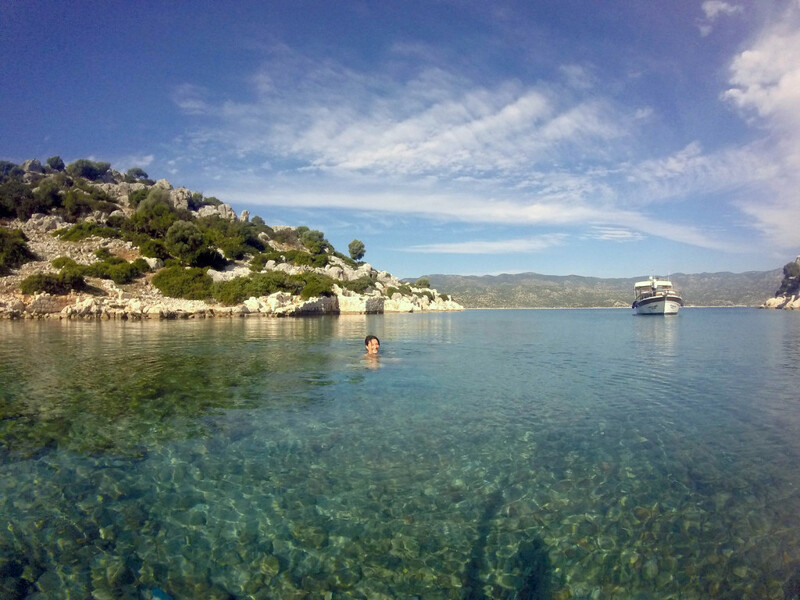 Low season meant we had the place to ourselves again, but we found the waters to look more green than blue. Further around is the abandoned Greek village of Kayakoy. 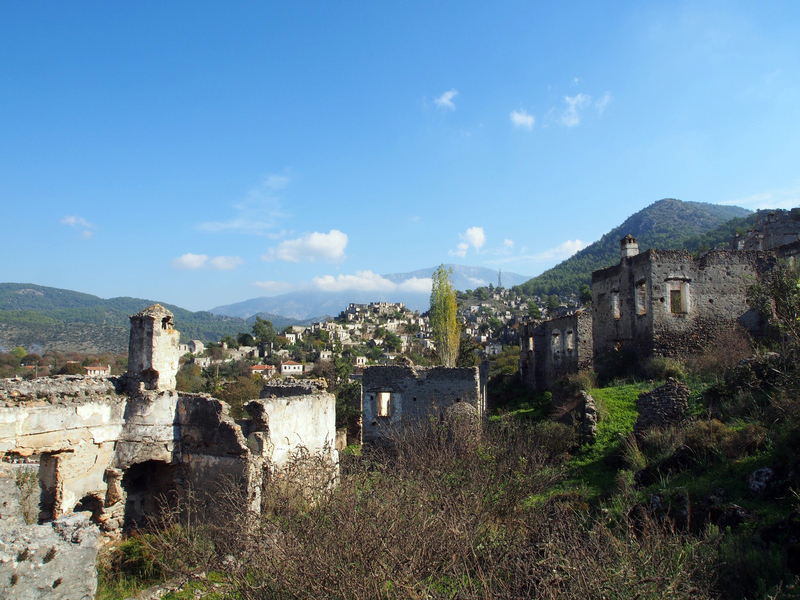 In the 1930s, Turkey and Greece proposed and carried out a huge population swap to repatriate each other’s minorities, resulting a huge displacement of people. 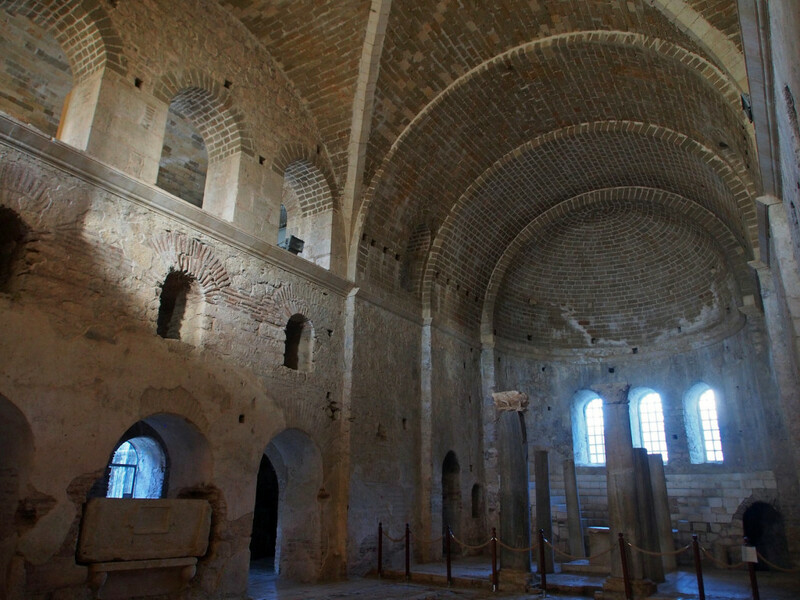 Although the lower parts of the town have been occupied by ethnic Turks, there’s still over 2,000 houses, churches and other buildings lying abandoned for over 70 years. 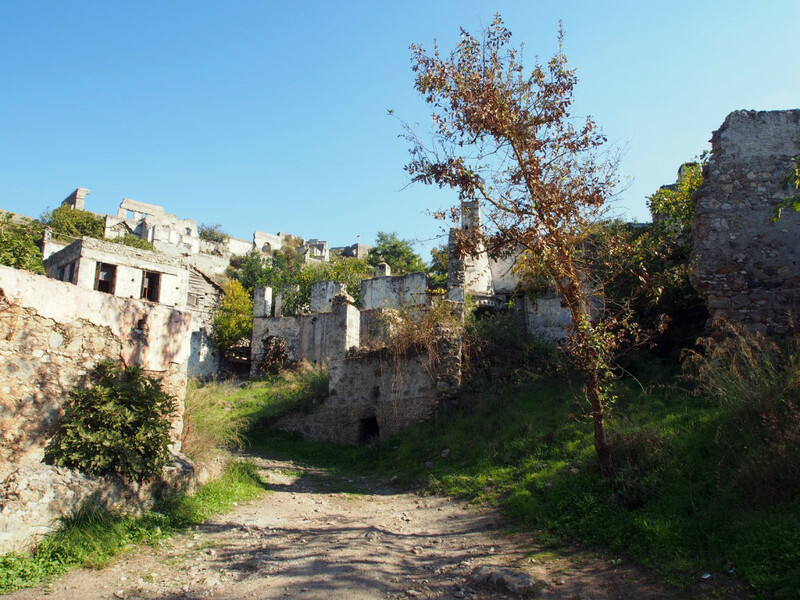 It’s a spooky place to walk around, imagining yourself in a post-apocalyptic world. 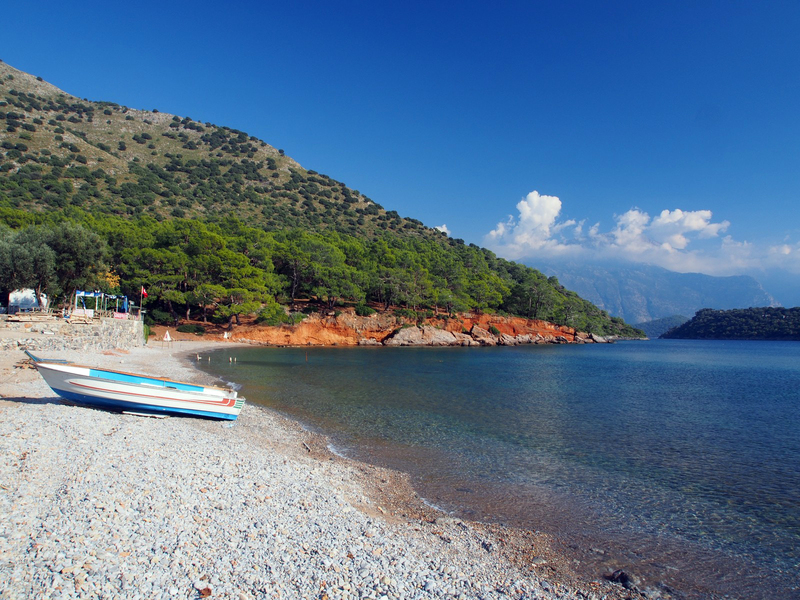 Feeling the need for another swim (since it’s been so long since we’ve been near the sea), we wound down a precipitous track to Gemiler Beach, and had a quick dip – although I do miss the golden sand of Australian beaches compared to the rocks of the Mediterranean. 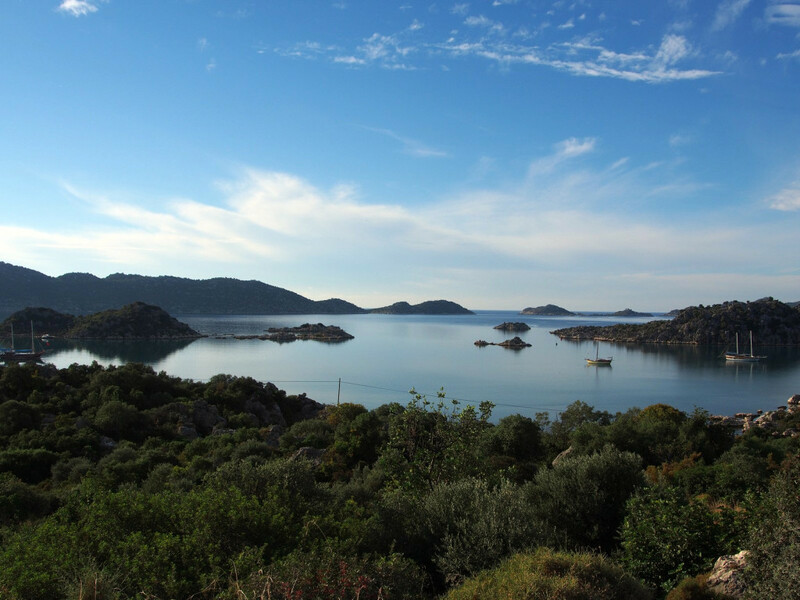 Our next destination was the city of Bodrum, a jetsetter’s town and one of the largest in the region. 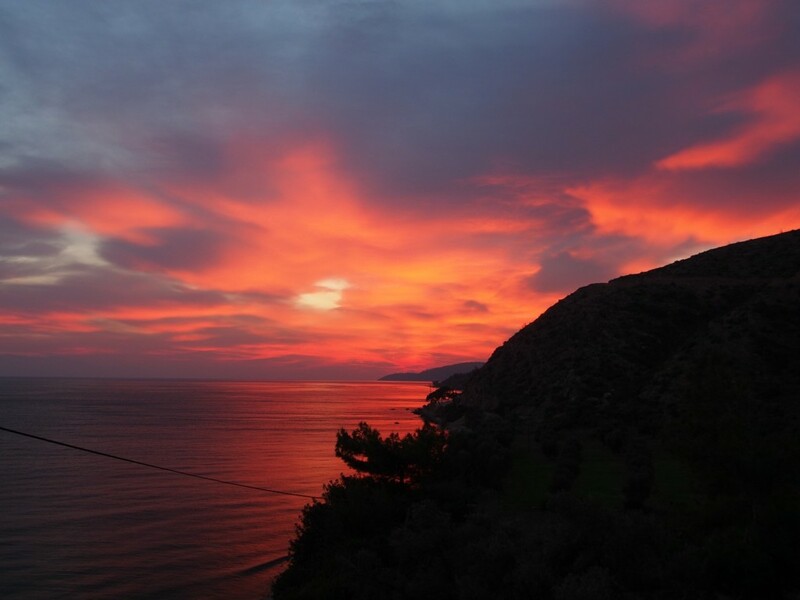 We rode through the afternoon and into the night along minor backroads, and were treated to one of the best sunsets I’ve seen in a long time.